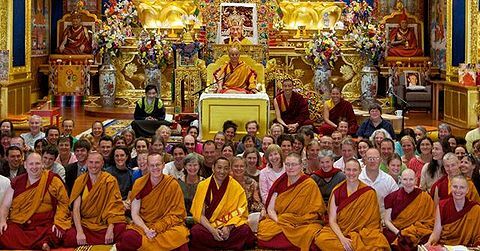 From May 25 till June 5 2010, Khenpo Pema Sherab taught the first of a series of teachings on Mipham Rinpoche's Beacon of Precious Certainty concluding Lerab Ling's 2010 Shedra West programme. Khen Rinpoche taught directly on the root verses, using the structural outline of a commentary by the great Khenpo Jamyang Drubpé Lodrö. He completed teaching on the third question, and began to teach on the fourth. His teachings clearly brought out some of the key themes of this profound text. His attendant and translator Lopön Sonam Tsewang gave clarification sessions every afternoon in English. During this visit, Khenchen Pema Sherab also began teaching the Lerab Ling monastic community on two occasions, one for the getsüls and one for the gelongs. For the former group, the text was Khenpo Tsöndrü's A Concise Explanation of the Trainings of a Novice Monk which is Easy for Beginners to Understand. On the last day he gave the lung for the Beacon of Certainty, as well as for the text Ascertainment of the Three Types of Vows, concluding with some heart advice to the sangha. Khen Rinpoche kindly agreed to return and continue teaching on the same text the following year.